My mom texted me about some confectionery shops in NYC that she saw on a TV show, and she won't be able to come and visit me any soon, I went to one of the places she mentioned. 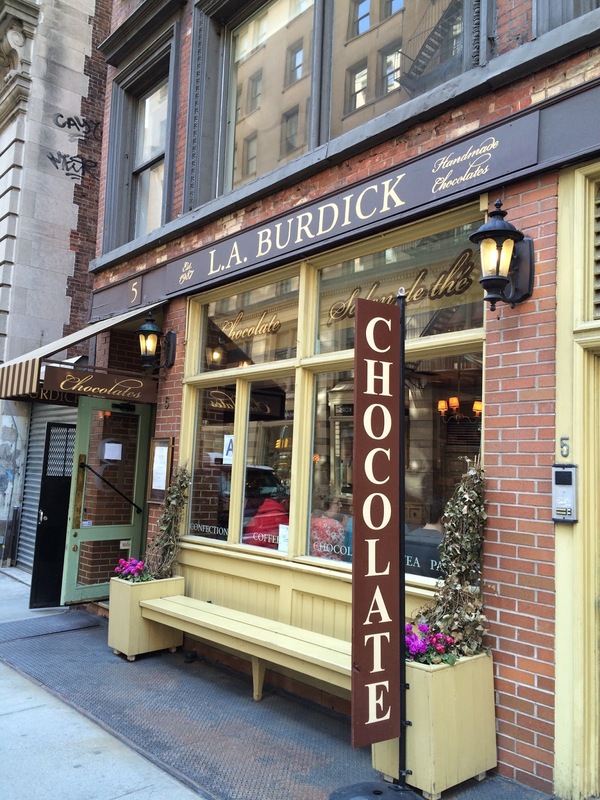 It's called "L.A. Burdick Chocolate" and it's a high-end artisanal American chocolate shop open in 1987 by Larry Burdick. 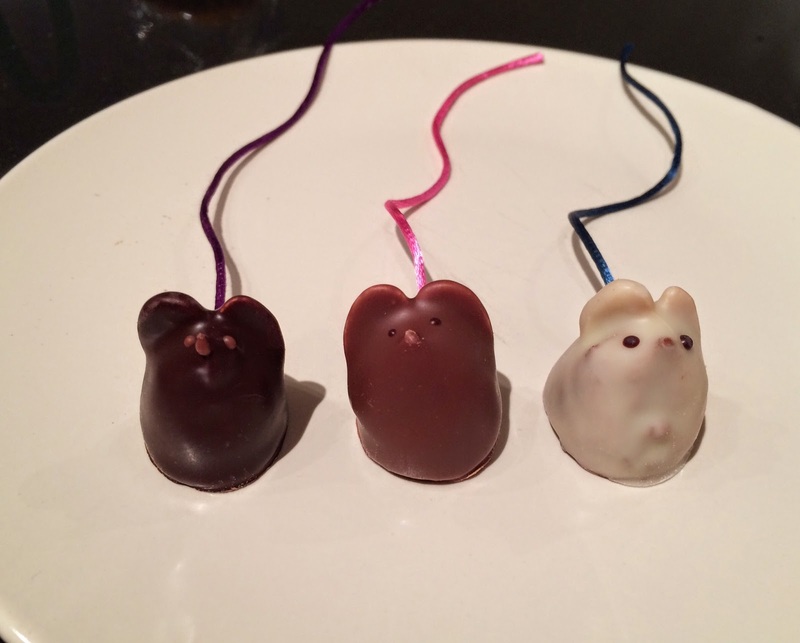 Their famous chocolate is "Chocolate Mouse," that is a mouse shaped chocolate with colorful string coming from the bottom. I got there around 3 PM on Monday, but many of the seats were taken. 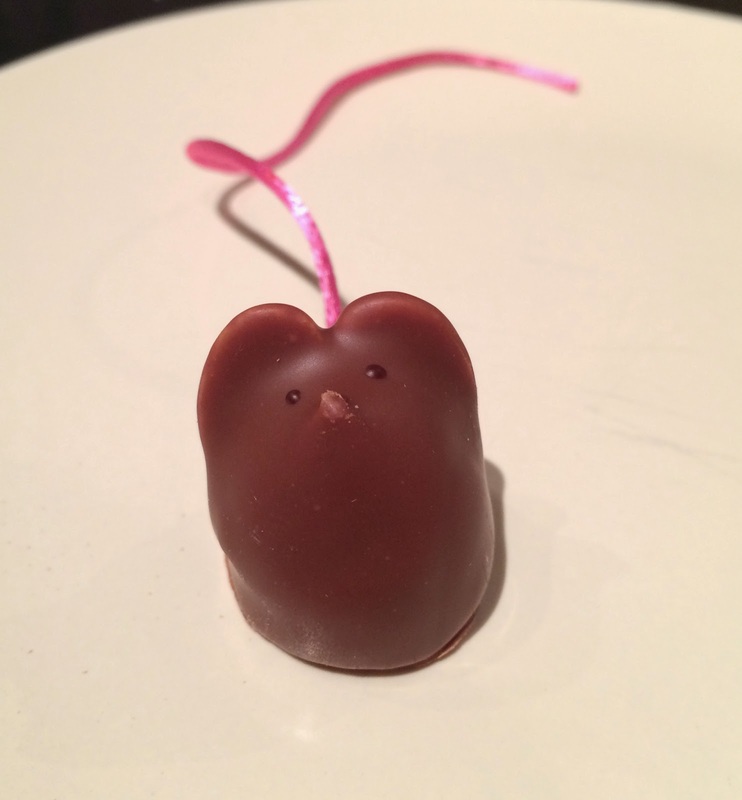 However, my mission was to get the Chocolate Mice and they're for to-go, so it didn't matter. 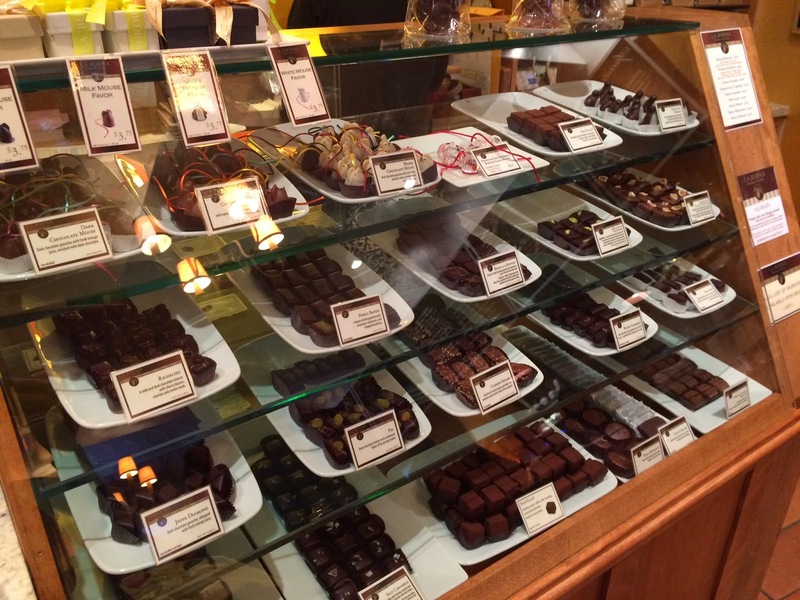 Besides the famous mice, there're other good looking confectioneries. I was about to say, "Whata...!?" but I bought all the 3 kinds anyway besides a Chocolate Penguin. 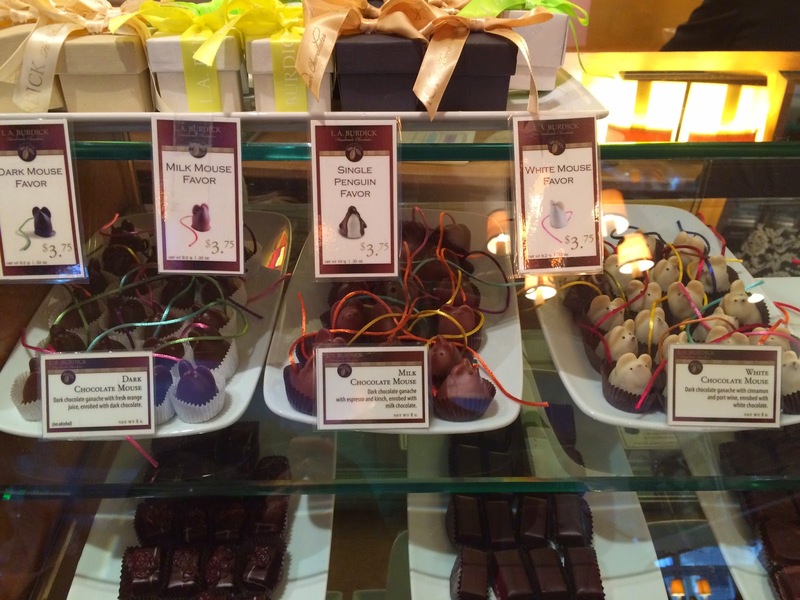 The way they wrap the chocolates was anticlimactic, frankly speaking. 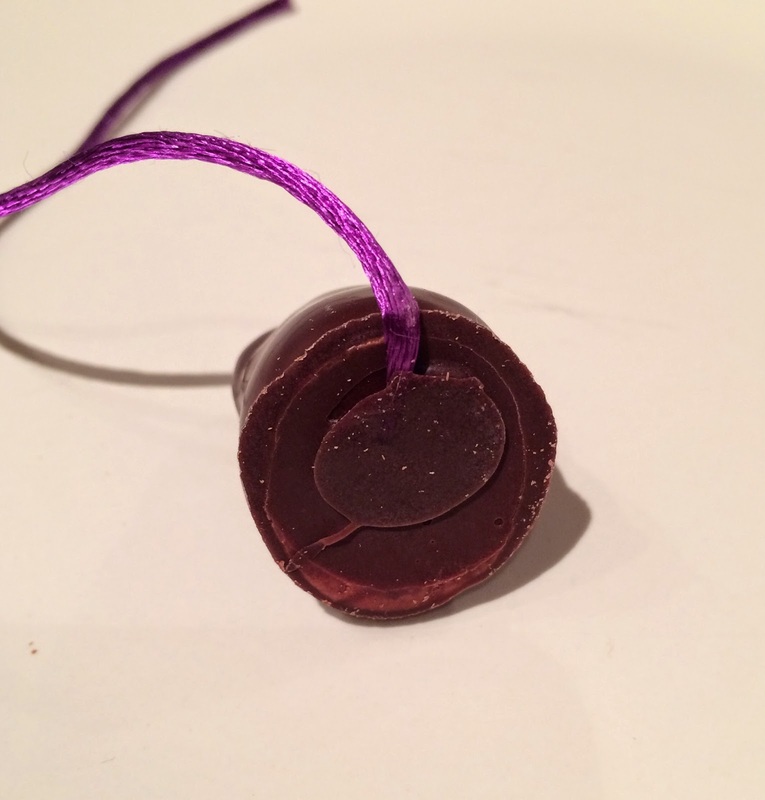 They only put the "artisan" chocolate into a plastic pouch and gave it to me without paper bag or anything, so I had to wrap it softly with my knit hat to carry it home safely in my bag. I thought it'd be nicer if they could be more sensible for the wrapping all those delicate chocolates. 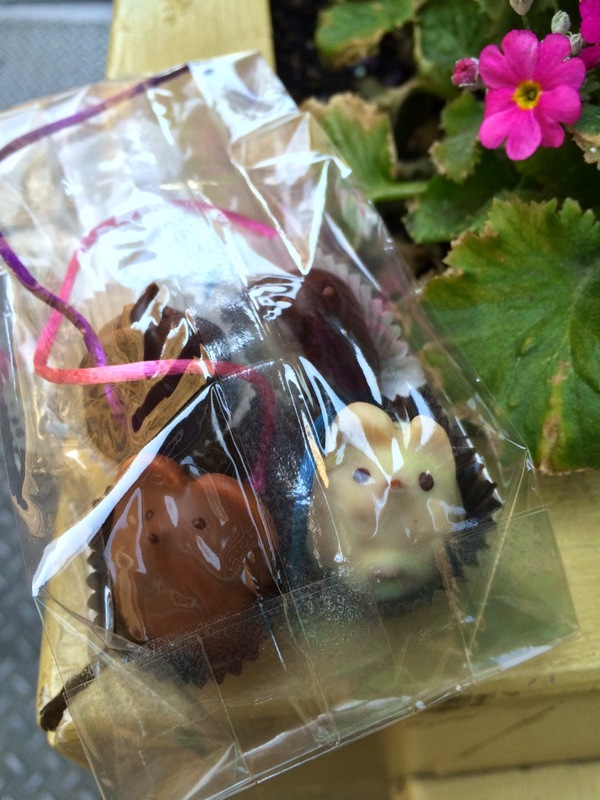 From the left, dark, milk and white chocolate. 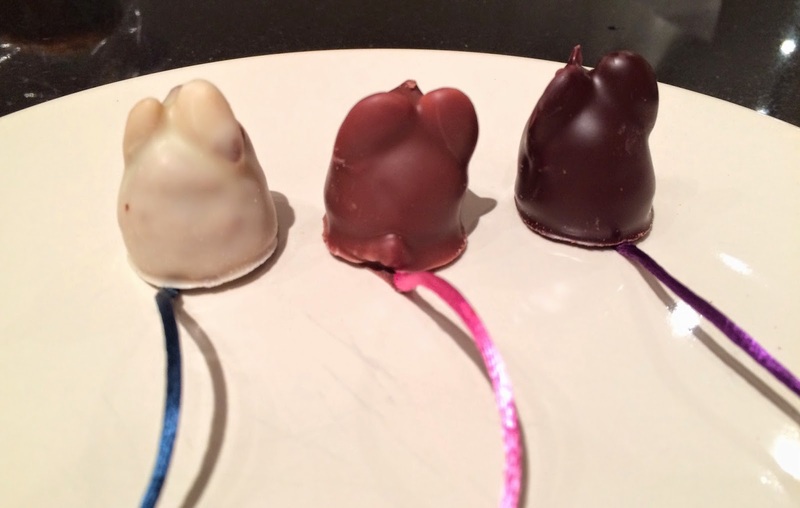 The sizes were varied as each mouse is handmade, but I measured milk chocolate. The largest part of the bottom was about 3cm (1.2 inch). 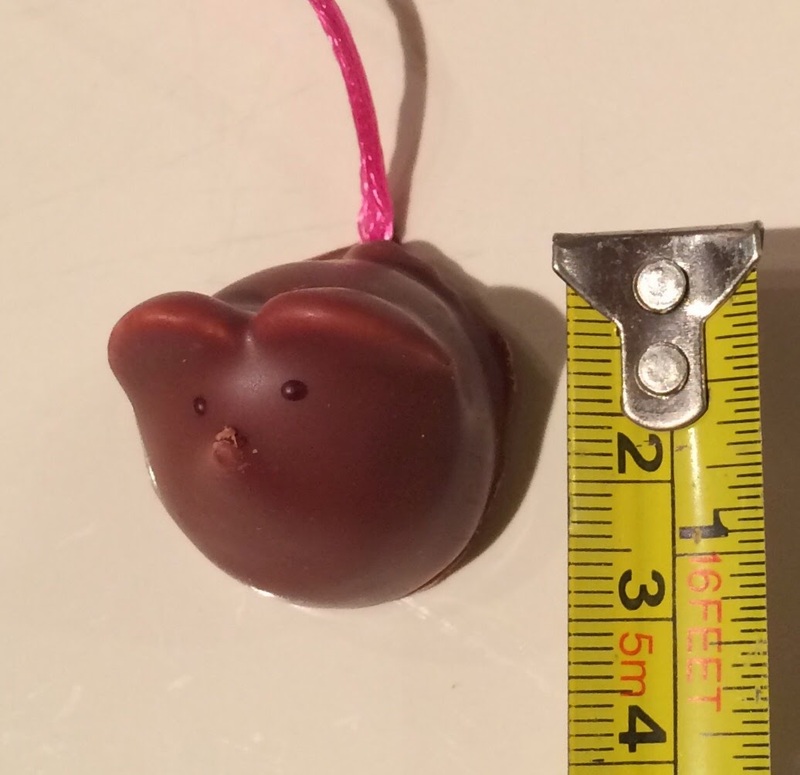 The height was about 3cm (1.2 inch). 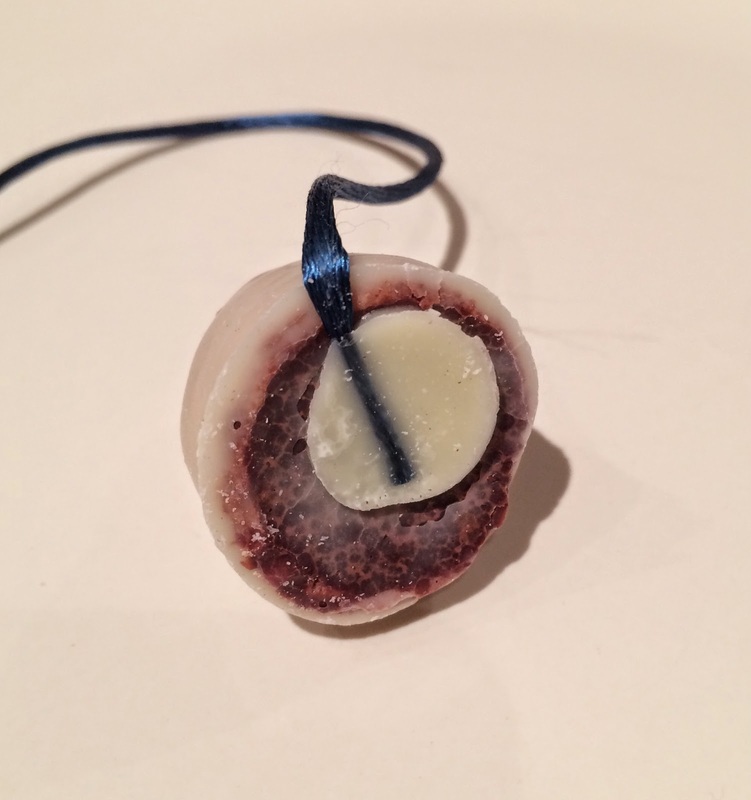 To make the most of the design, it's to hold the string (tail) when you eat. 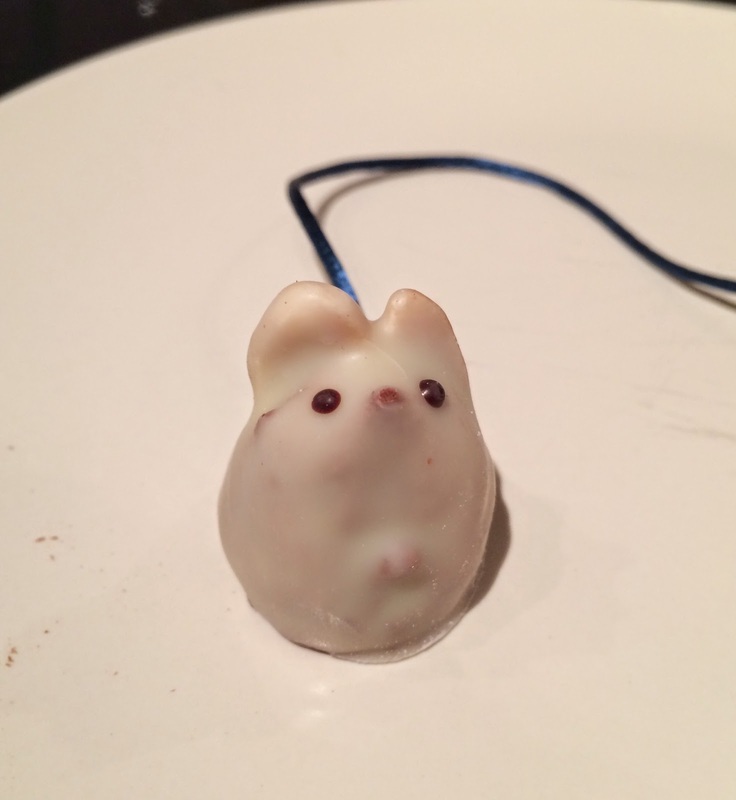 The face was very cute with little eyes. 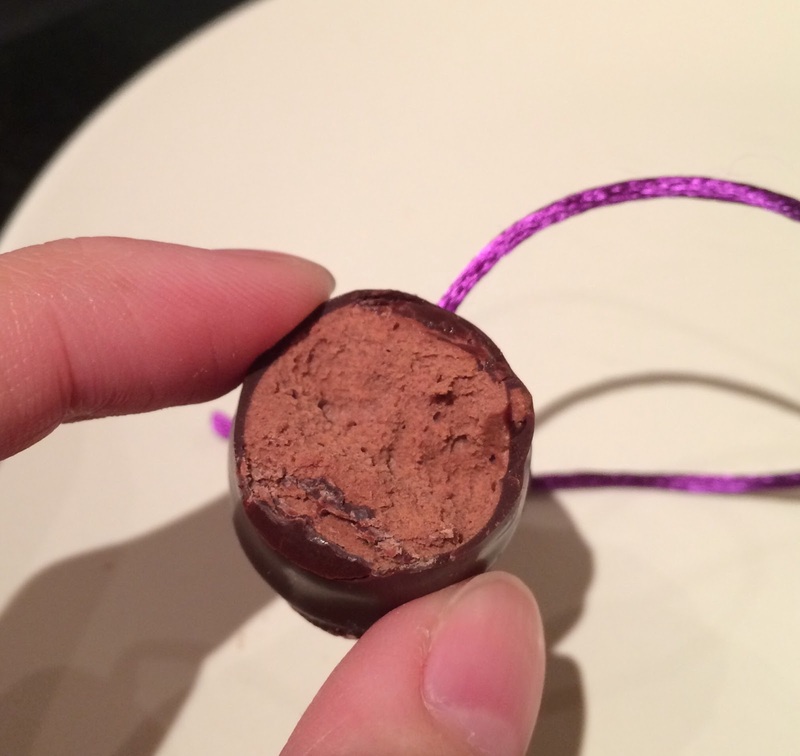 At the bottom, I could see the string was bonded by some melted chocolate. 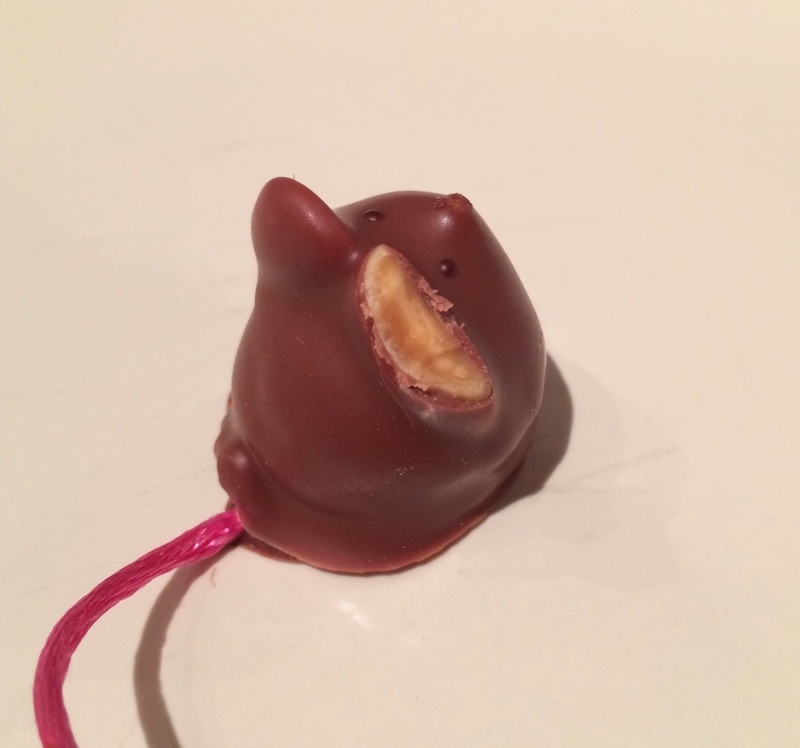 The ears were made with crunchy almonds. 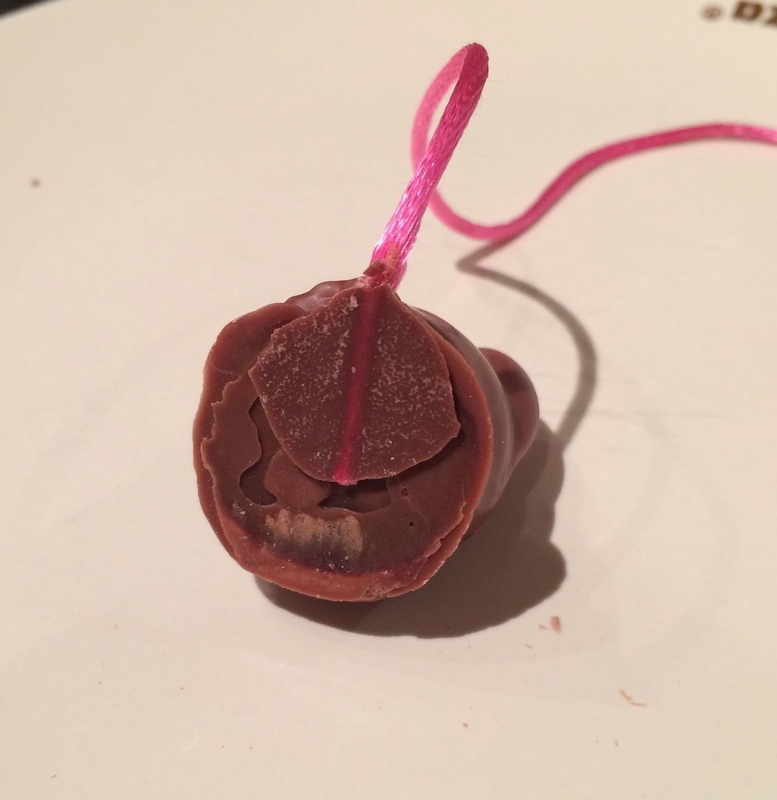 Underneath the melty chocolate, there's whipped chocolate. 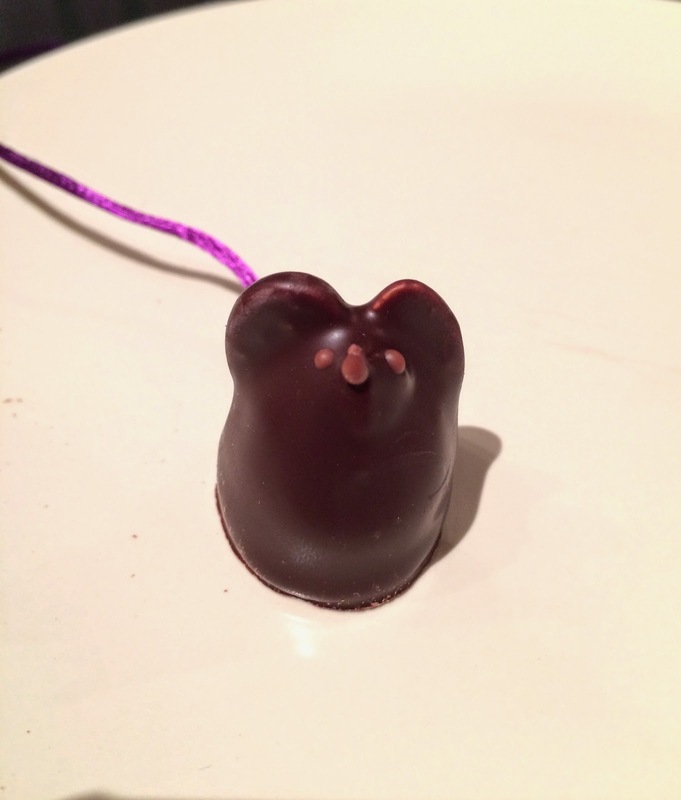 The eyes were slightly larger and the ears were uneven. 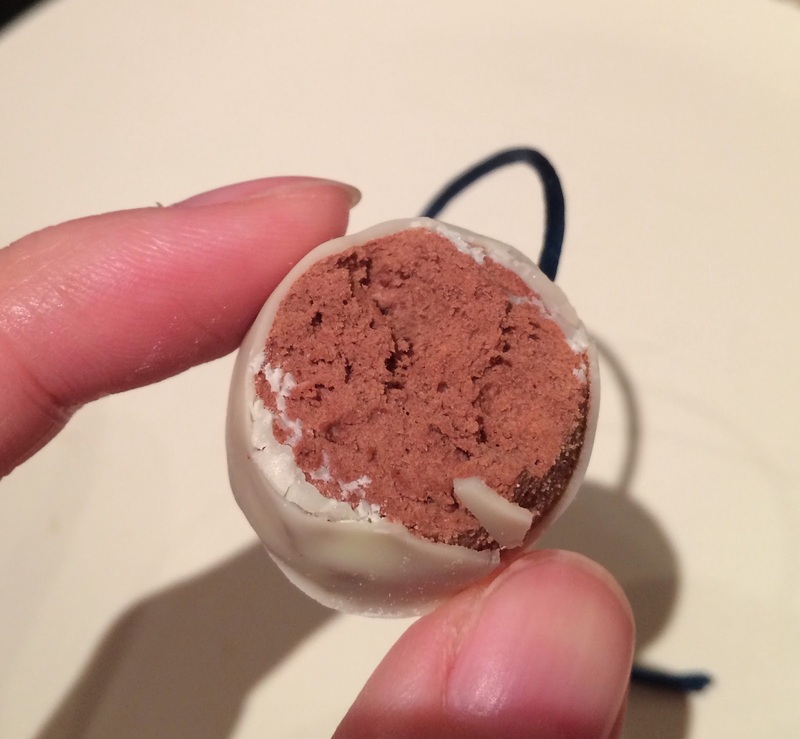 The fully whipped filling had rich flavor so that I didn't really taste white chocolate. 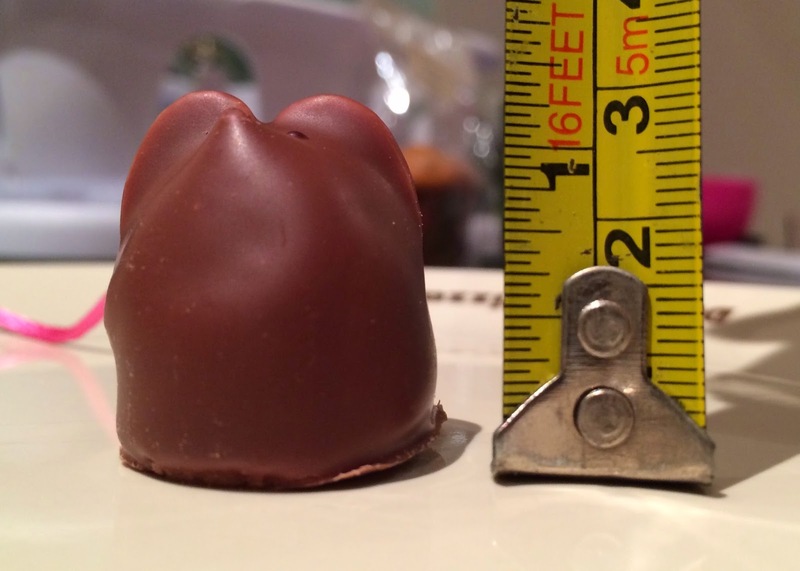 A sharp and a rounded ear with pointy nose. 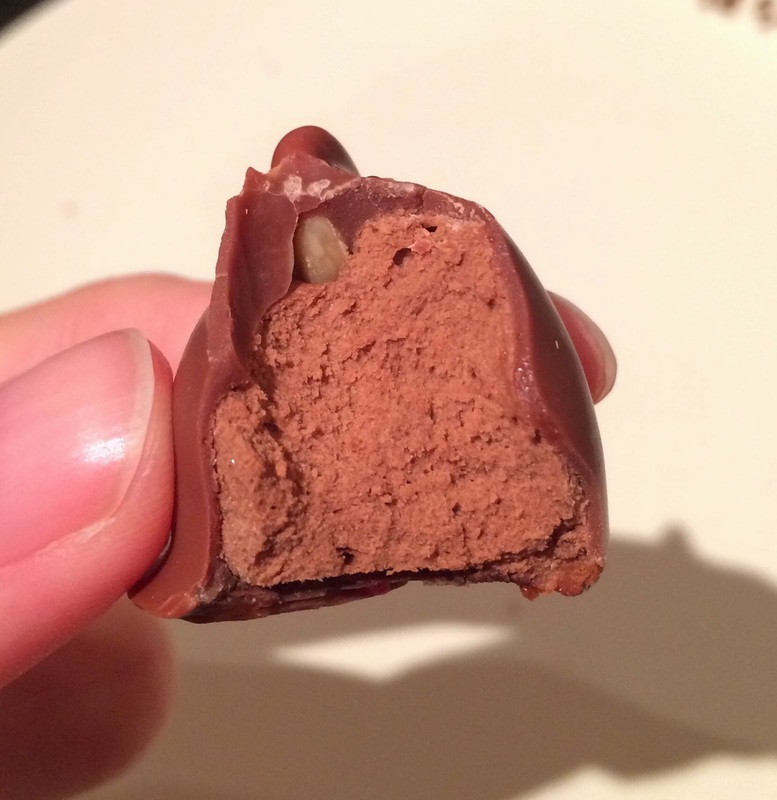 The filling had some alcoholic scent, but except that, the filling seemed all the same. When I read the HP, it said that dark chocolate with whipped orange interior (I have no idea what "interior" here it means), milk with robust mocha filling and white with cinnamon with a hint of port. 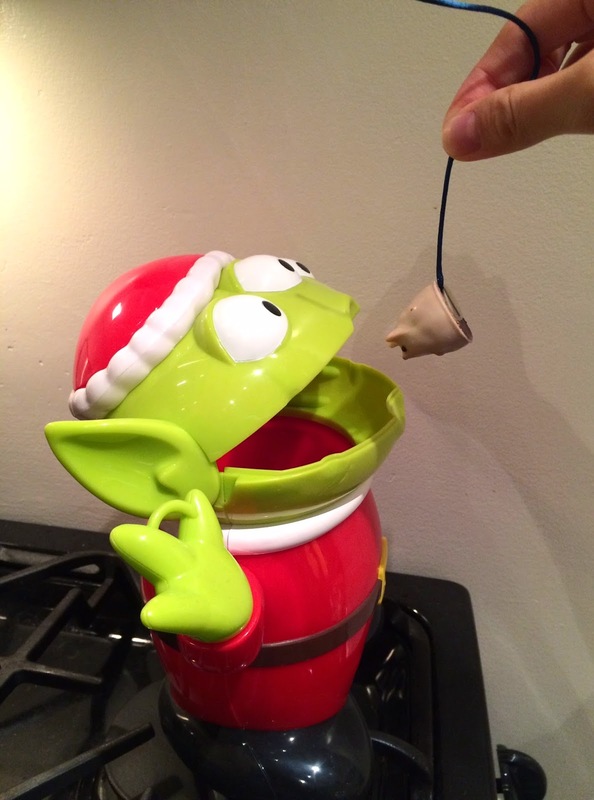 It had pricey chocolate flavor, and I understand it's a time-consuming product, however, it didn't have any surprising taste or flavor that makes me say, "I'd love to buy again." Maybe these are suitable as a small gift.